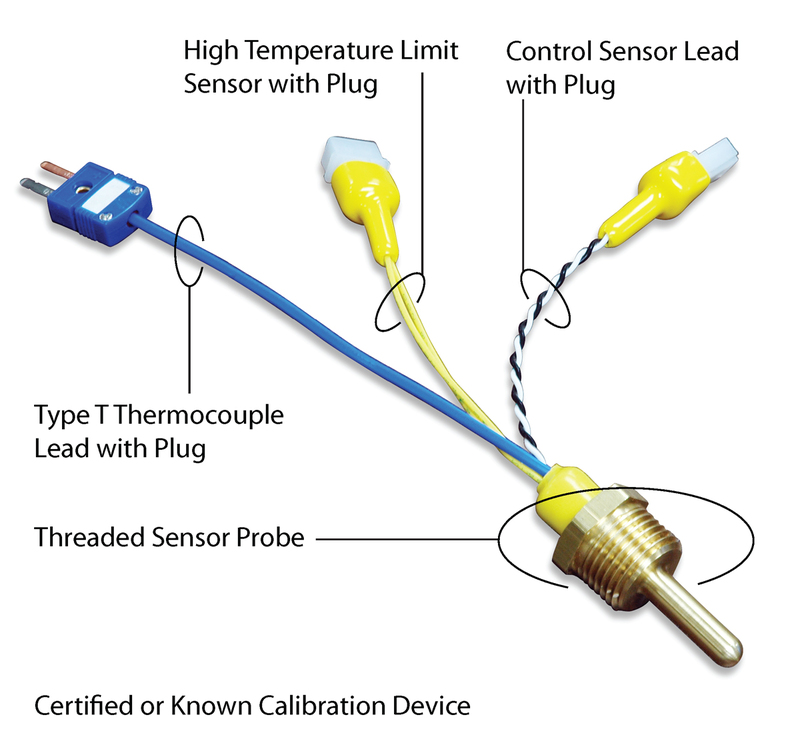 Many processors have temperature sensor calibration requirements established based on ISO or other quality standards. 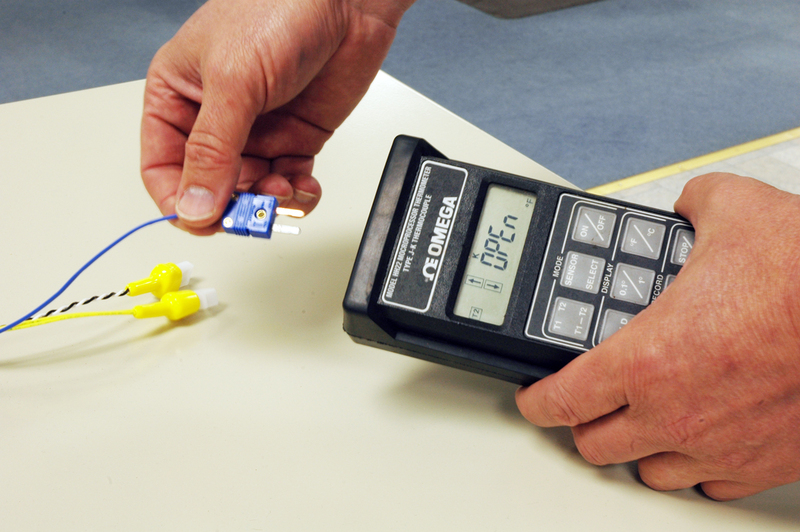 These calibration standards usually require periodic calibration checks on all temperature devices in the plant. Most Advantage control instruments use solid state temperature sensing devices and are best calibrated by removing the sensor from it’s mounting location and either calibrating by insertion into an ice bath or calibrating the sensor to another known temperature as defined by the user’s procedures. Removing the sensor is time consuming and using an ice bath is often not desirable. Advantage Electronics has developed a sensor probe (see photo 1) that has an integral Type T thermocouple housed within the sensor body along with the instrument’s solid state sensor and high temperature limit switch. Without removing the sensor probe from the machine, this “metrology sensor” is calibrated by inserting the thermocouple plug into a certified meter (photo 2 & 3) and adjusting the control instrument to the correct reading. 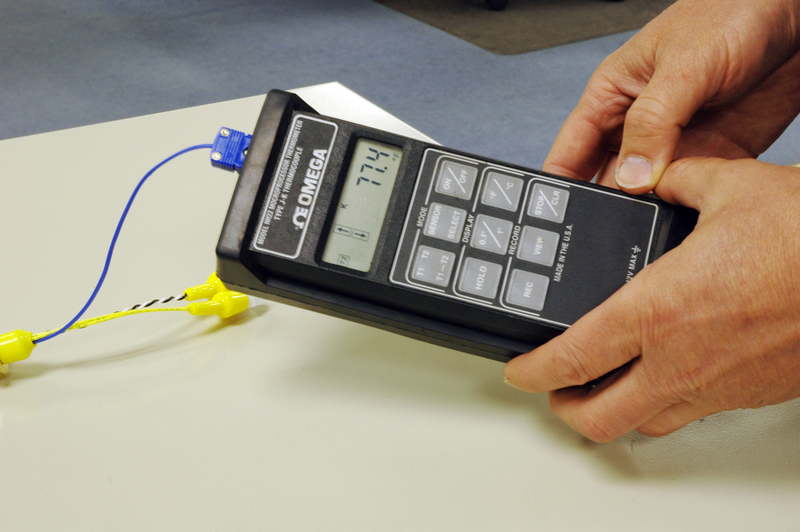 ‘Special Grade’ thermocouple wire is used in the manufacture of the T thermocouple probe. This gives a Limit of Error of .5°C or .4%. Any processor that has written calibration procedures that require periodic instrument calibration and any user that wants an easy way to calibrate their machine’s control system. Processors doing business in the medical, automotive and aerospace markets often have these procedures in place. Metrology probe can be purchased from Advantage Engineering as part of any new machine at a modest cost adder or from Advantage Electronics (317-888-1946) as a replacement for standard probes. The Advantage Electronics part # is 230410. Would you like to Download FYI #292 to your browser?